Visualize is dedicated to empowering midwives to screen for cervical cancer by creating and implementing educational training devices. Every year, 275,000 women die from cervical cancer, and eighty percent of these deaths occur in low and lower-middle income countries (LMICs). Screening for cervical cancer significantly reduces mortality, given that most cervical cancer and pre-cancer cases caught early are treatable. Unfortunately, many LMICs lack the infrastructure for traditional screening. In Ghana, where cervical cancer is the number one cause of cancer-related death for women, less than 5% of women have ever been screened. Pap smear, commonly used in higher income countries, is prohibitively expensive and not well-suited for use in LMICs. 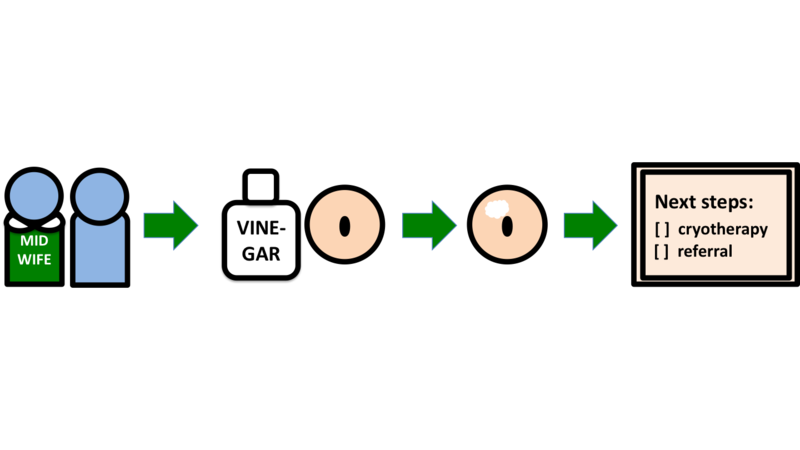 Visual inspection of the cervix with acetic acid (VIA) is an alternative, low-cost, and effective method to screen for cervical cancer. VIA is currently the most accessible “see-and-treat” approach to screening and has been shown to be viable in low and lower-middle income settings. upon visualization of lesions, the midwife either refers the patient to specialized medical care or uses cryotherapy to remove these cells. Unfortunately, VIA is not widely used due primarily to a lack of training and awareness of the method. With proper training and follow-up, VIA can avert 68% of cervical cancer deaths. We estimate that VIA and subsequent treatment can save 150,000 lives in LMICs. The aim of our project is to design and implement training for VIA cervical cancer screening in Ghana. A number of people and organizations have attempted to address the issue of cervical cancer detection and early treatment before, but none through the lens of trainer-based education. Most programs have focused primarily on the role of conducting VIA in cervical cancer screening in low-resource countries, and in general, their results have been very positive. However, none of these programs have focused specifically on developing and distributing an effective VIA training method, and this is the gap we are working to fill. We have developed a cervical cancer screening training model that aids midwives and other healthcare providers as they learn how to screen for cervical cancer using VIA. Our training module aims to empower midwives to perform and teach others to perform VIA. As more midwives are trained, more women are screened for cervical cancer. By detecting pre-cancerous cells early, women can get the treatment they need in time to save their lives. Over the past 4 years, the Visualize trainer has gone through multiple iterations with input from over 100 experts and stakeholders, including midwives and healthcare administrators in Ghana. We are currently piloting implementation of trainers in Ghana to assess their impact in aiding midwives to efficiently learn to perform VIA. 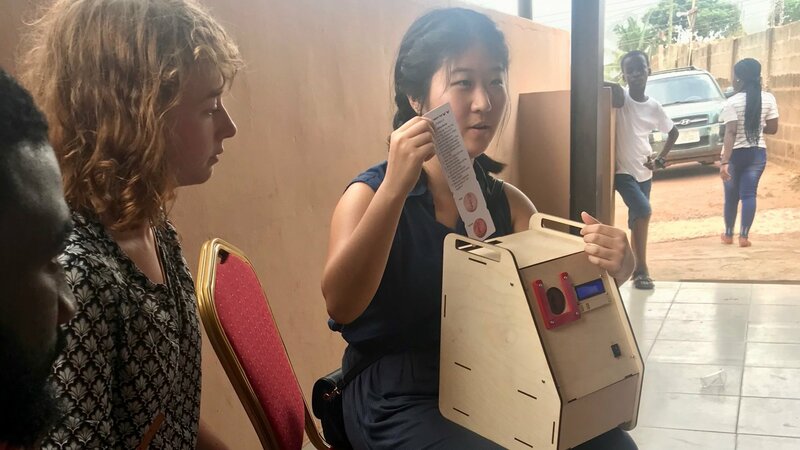 A photograph of the most recent iteration of the device being tested with beneficiaries in Ghana is shown below. Visualize is a novel approach to the challenge of cervical cancer mortality. While many approaches exist to improve access to cervical cancer screening (including training midwives to screen), no other program, to our knowledge, has focused on creating a physical simulator training device. The Visualize trainer allows students to practice cervical cancer screening in a low-risk educational environment. 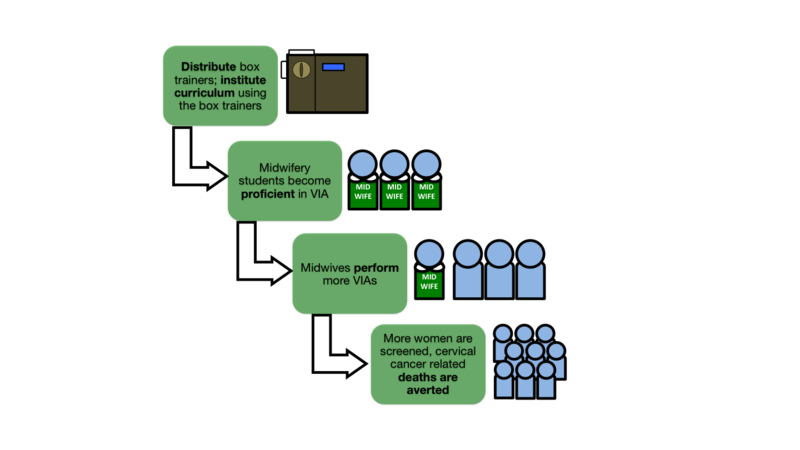 A variety of other educational methods are used in cervical cancer screening training, like the Jhpiego training flashcards and “Atlas of Unaided Visual Inspection of the Cervix”, but these tools don’t offer a realistic clinical situation, which is essential for effective training. The purpose of the Visualize trainer is to provide procedural fidelity of the actual VIA procedure. We use simple materials in novel ways to create this low-cost, realistic piece of technology. The Visualize trainer works by allowing a midwifery student to pass a speculum through a simulated vaginal cavity and view photos of a sample patient’s cervix before and after acetic acid is applied. After comparing before and after images of the cervix, the student makes a diagnosis of VIA-positive or VIA-negative. After pressing either + or - on the device, a screen tells the student if they are correct. In the next 12 months, our goal is to build 10 devices to be distributed to collaborators in Ghana. Our collaborators will then provide feedback on the device as they use it for their own training purposes. They will also help us develop a curriculum to complement the Visualize trainer. At the same time, we aim to work with Ghana Standards Authority to certify the device to be used in the country’s standard midwifery curriculum. In a year, our goal is to have a collaborator-validated, Standards-certified device paired with an in-depth training curriculum, ready to be implemented with students. Our long-term vision has two parts: (1) train already-practicing midwives to perform VIA, and (2) train current midwifery students to perform VIA. For part 1, we aim to offer continuing education courses by partnering with training hospitals so practicing midwives can learn VIA, as they did not have the opportunity to learn VIA in university. For part 2, we aim to distribute the Visualize trainer and curriculum to midwifery schools across Ghana so all midwifery students can be trained in VIA. Taken together, the two-part approach aims for all midwives in Ghana to learn and perform VIA. Our primary beneficiaries are practicing midwives and midwifery students who would like to learn VIA. To reach these populations, we will lean upon our network of existing and new collaborators in Ghana. We have strong relationships with other cervical cancer screening organizations in the country, including Zurak Cancer Foundation and Global Cervical Charity Foundation. We aim to develop relationships with Ghana Health Services, the implementation arm of the Ghanaian healthcare system, and various training centers across the country including training hospitals and midwifery schools. These relationships will allow us to access, train, and monitor the progress of our beneficiaries. We are a group of tenacious information gatherers, which allows us to attract resources and partnerships needed to succeed. Our team is composed of highly dedicated members. The two co-founders of Visualize have remained dedicated to this project even as we have personally shifted universities, degree programs, and geographic locations. In the past 4 years, we have never wavered from our commitment to continue working towards implementing the Visualize trainer. Our team also has a deep research-oriented mindset. Our co-founders are a medical student and an engineering PhD student with strong interests in knowledge generation, rigorous evaluation, and discovery. Our revenue model now is primarily grant-based. To build and test the Visualize trainers, we require capital investment up-front for materials and manufacturing. We have previously fundraised a total near $20,000 to build, test, and travel with our devices. As we are now closer to implementation, we require more funding to continue building and delivering devices across Ghana. Once the trainers are built and distributed, our costs will decrease significantly and we can begin to see a more self-sustaining revenue model. We do not intend to sell the Visualize trainer because we have found the willingness to pay for our trainer to be fairly low. However, we do intend to charge a fee to use the Visualize trainer in a continuing education training environment, and we have seen much more enthusiasm and reception for this idea. Therefore, we believe that we can partner with medical training facilities to charge an affordable fee for students to take a continuing education training class with the Visualize trainer. Once this model is established in Ghana, we will be able to consider expanding into other parts of the world drawing upon the lessons we have learned and the funding we have gained. We are applying to SOLVE for the opportunity to gain funding and to access a network of global development problem solvers to support us in implementing the Visualize trainer. SOLVE can provide us with connections to global health thinkers around the world, who can help us learn how to best improve and implement our approach in Ghana. The SOLVE platform also may provide us with media exposure, which we anticipate will allow other kindred and complementary organizations to find us and contact us about partnering. The biggest barrier we have encountered so far is working remotely between the U.S. and Ghana. While this is circumstantially unavoidable, SOLVE helps us by providing the opportunity for more funding and therefore more travel. We do anticipate challenges in getting approval from Ghana Standards Authority and the Nursing and Midwifery Council. We have had pleasant and optimistic initial conversations, but we envision the process to verify our training device will be long and winding. SOLVE can help us by connecting us with folks who have experience working through these and other implementation challenges in global health work.